Wire harnesses are found in many devices used in our daily lives including automobiles, home appliances, cell phones, etc. The reliability of these devices depend on quality crimps. Crimp Force Monitors (CFM's) have been employed in many crimping departments to provide 100% on-line inspection of crimps for over 20 years. If your harness maker doesn't have CFM's installed on all their crimping presses you probably should look for a new supplier. 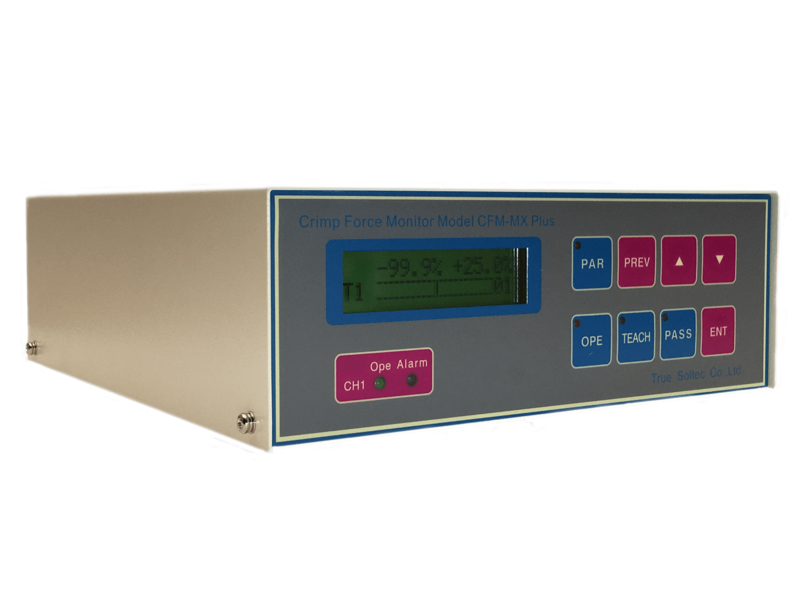 MX series Crimp Force Monitors are available in single channel (MX10) and two channel (MX20) models. MX10's are for manual crimping presses. MX20's are for automatic wire processing machines with two crimping presses. MX CFM's have been around for over 15 years and have withstood the test of time in many wire harness factories all over the world. The simple T1, T2, T3, TD force curve analysis tools are well accepted and easily understood. A piezo electric force sensor is installed on the crimp press. It can be a "ring" sensor installed in the base plate or ram adapter. Or it can be a "frame" sensor mounted to the crimp press frame. When the setup work is finished and a proper setup validation completed the operator performs a teach-in. During teach-in MX "learns" the shape of the normal crimp force curve. During production the shape of every crimp force curve is compared to the "learned" reference. If any changes in the force curve shape are detected an alarm is given. CFM MX10N for benchtop and semi-automatic crimping presses. CFM MX20N for fully automatic wire machines.